In Russia, for the past day, September 9, 1018 people were detained during protests against pension reform. According to the Russian human rights portal "OVD-Info", the most persons were detained in St. Petersburg and Yekaterinburg (452 and 183, respectively). In Moscow, on the fact of holding a campaign against pension reform, a criminal case was instituted. 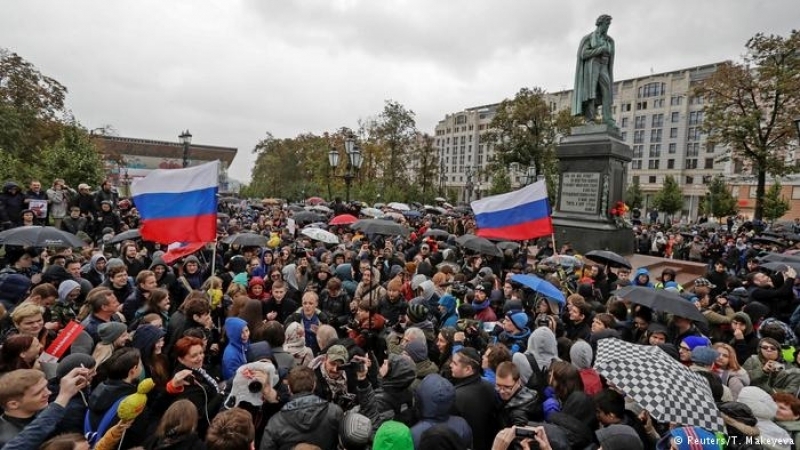 The Russian opposition activist Aleksei Navalny called people for the action. The opposition chose this day for mass rallies, as on September 9, elections of governors, mayors and MPs were held in Russia. It should be noted that the first rallies against pension reform took place this summer. The residents of the annexed Crimea also came to the streets in protest. Reference: On July 19, the Russian State Duma supported the bill on raising the retirement age. It can be raised from 55 to 63 years for women and from 60 to 65 years for men.